Right now you can get this Monogrammed Seersucker Weekenders ONLY $19.99 (Retail $49.99)! 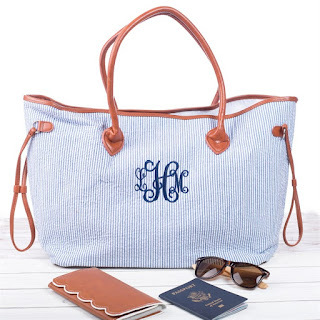 These Monogrammed Seersucker Weekender Totes are the perfect travel bag! These oversized tote bags are complemented with a big and beautiful monogram. Each canvas tote is quality made with seersucker fabric, imitation leather accents, button closures, interior zipper pocket, and charming accent stitching. With 3 tote bag colors, 17 thread colors, and 8 font choices, you can design your perfect weekender bag! $6.99 for the first item and $2.99 for each additional item. US only. Ships no later than Fri, Aug 3.